"Christmas Open House at Curb Market"
I stayed home on Friday and enjoyed the day but Saturday I got up early to go to "Curb Market"! Everything homemade....tables laden with loaves of homemade breads, cakes, candy....Fresh greenery arrangements....ornaments and several Raggedy Annes and Andys and even some sock monkeys! I parked on a side street just as the horse drawn carriage came around the corner with the largest black horse that I've ever seen pulling it. I was parked in front of a Bed and Breakfast with beautiful Christmas decorations on the porch. No camera.......but memories of a simpler time in life. It was magical........scents and sights of the season. Inside the front door I was met with a Christmas tree, the scent of apple cider and Carolers with dulcimers, fiddles, guitars and even a boy with hand bells.....everyone singing Christmas favorites. When I got home I had an email from Catherine Holman! I won her drawing for these beautiful Folk Art Prints! I was so excited! I would say I was doing the happy dance....except that I was mostly jumping UP and down......and up and DOWN! lol Thanks Catherine......I am THRILLED! 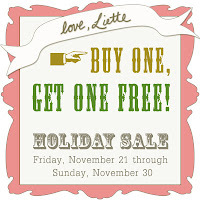 I have been watching her site for the BIG HOLIDAY SALE! Check it out! blogs to visit, new crafts to try and recipes to make. Thanks to everyone that makes a difference in my life. God continues to bless our lives. Wishing you a special day filled with all of God's blessings! And enjoy this card.....CLICK HERE! Ooohhhhh......I love packages in the mail! even when you know what's inside! And jen at the fabled needle really does the packages up right! Thanks jen!!! It's a delight just to open it up and see all the pretty cards and notepads! We have the most beautiful Autumn vine commonly called Bittersweet,here in the mountains. It is an aggressive plant that is not welcome everywhere but for crafters it makes a fun project. I have wound it around to make a pretty wreath and this year I just put some of the vines on the mantel among candles and pinecones. I love all things natural from the outdoors. I have a tall basket that I change according to the seasons and I sometimes fill with bittersweet or wrap a vine around the handle. looking outside when the leaves were still at peak! Annie and Wendy with their Boyd's Bear dollie! with so much detail in her little fairy clothes! I love her! to take the live plants out of one of mine and make a home for my fairies. my sweet little fairies love their special home. The two fairies were created by the artist Cheri McAfooes and I treasure them! If you click on the picture below you can see the detail in these fairies! I've been visiting the fabled needle for as long as I've had a blog and I've always wanted to order something from jen! Today she announced a BIG HOLIDAY SALE and I knew it was TIME! I ordered "Beth Goes for a Walk" Greeting cards and "Blackbirds" Notepads from her Etsy shop! Aren't they wonderful! I love "buy one get one FREE" sales anyway! Thanks Jen! You are SO talented! Happy Holidays! Sometimes you find a blog that changes your life! We think about food.....and talk about food...... and love making new recipes so I was THRILLED to find this blog, Mennonite Girls Can Cook and start trying some of their recipes. They use wholesome ingredients and give such good instruction! I made the Stuffed Breast of Chicken last night and it was delicious. We have some smoked Canadian Bacon that we get from our neighbor Rocky and it added so much flavor! I took pictures but they didn't turn out that good so I am sharing my flowers with you today. I went to the dentist this morning and walked out with a beautiful carnation! How nice! Thanks to my hygienist, Cathy and Dr. Tomlo......I LOVE to go to the dentist! I went back........to A Day in the Country! Penny and I saw so many beautiful things when we had lunch there and I live so close......I went back to look at the Christmas things they are putting out. I just had to have this little red tree and these cute kids! I don't have any other decorations out yet but I know I can find some trees and other things for this scene. It's fun to get started and buy something new this year! This poor baby didn't have a proper outfit! lol I made this little dress for her and put her in the arms of my sweet Lloyd Middleton curio doll. I met Penny at "A Day in the Country" for lunch today! 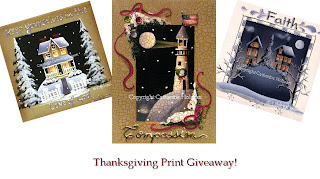 Her blog is Lavender Hill Studio and she is a Mosaic artist. I've been following her blog and admiring her work and realized that we live in the same town! Here she is modeling one of my latest creations......an apron! We talked.....and talked......and talked some more! We found out we had so much in common! Thanks for a delightful lunch, Penny! "You've Got Mail" of course! We watched it tonight and always love the 'colorized' leaves......bouquets of sharpened pencils, smell of scotch tape and the daisies. I have a bouquet of daisies on my bedside table, just like the one in the movie! AAAhhhhh!! I got the sweetest email from Adriana! I wrote her and told her how much I was enjoying the new cookbook and she wrote back that she remembered me....."Diane Darling, I could never forget you! "....and some other nice things! What a sweetheart she is! THANK YOU Adriana! You really made my day! Enjoy this beautiful weekend everyone! It was cool and windy this morning when I went to a "Bizarre Bazaar" at the Historic 7th Avenue District Depot Plaza. It was set up outside, with live music and even a clown with balloons! I found a pretty embroidered tea towel and a turquoise ring that I couldn't live without. FUN FUN FUN! I met Adriana Trigiani a few years ago when she had written her first book, "Big Stone Gap". She was delightful....friendly and full of energy! I have been thrilled to see her write many best selling novels now and this delightful cookbook! Add the rest of the ingredients, except flour, to the yeast mixture. 4 to 5 inches long. Create a circle by joining the ends together and pinching them closed. Place on greased cookie sheet and bake for 8 minutes, or until lightly brown. Cool. To find more recipes, visit her "WEBSITE" ! I voted! Thanks Delaney for the 'button' !!! .......well as much as I LOVE to create and as much as I am INSPIRED by beautiful things....I remain a die hard Dallas Cowboy fan! I blame it on raising four sons....and all that entails! I baked the Sour Cream cookies from the "Cooky Book" but I think they were a little plain. Maybe they need dipped in chocolate! heehee! I'm anxious to make the oatmeal cookies next! I love the cooler weather for baking! 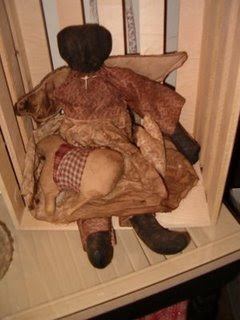 This is a precious little doll that is a 'give away' by a sweet lady on this blog! Check it out! Tonight is the deadline! I was looking through some old cookbooks this morning and here are a few of my favs! This was my very first cookbook!